The organisation specialises in Architectural Metalwork with its own in-house AutoCAD design. At all times we pride ourselves in producing a quality product for the end user and to this end you can view our works in the above links. All design work is carried out to meet the requirements of BS5395, BS6399 and BS6180. 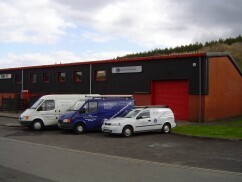 The company is based in the Pontypool area of South Wales within easy reach of the M50, M4 and M5 motorways. We offer a full turnkey service of design, manufacture and installation. The management structure allows the company to process orders from as little as £500 up to a value of £200,000.